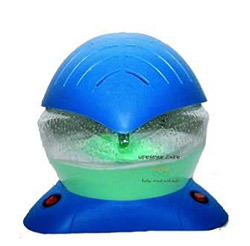 Products & Services-> BLUE Rainbow -Air purifier-Pefectaire,with changing LED lights. With the magic of the Rainbow Air Purifier you can enjoy breathing clean and healthy air, keeping your body at its best the way nature intended! When using the Rainbow Air Purifier along with our range of Aroma Essence you get to see the pot of gold on the other side. breathe easier, feel healthier, relaxed, confident and revived! Trapping germs and bacteria in the water bowl, our microbe solution invigorates , uplifts, relieves sterss,rejuventates and more.SABS tested to kill bacteria and remove harmfull allergens fro the air- no1 in SA.Machines come in:Come in White; black ; green; blue;pink ; changing LED lights and 3 settings to keep lights on or off or changing color. Like Magic, Just PerfectAire Purifiers.